Shimano's most recent release of rear cassettes, employs what they call "HyperGlide" compatibility. HyperGlide is a term that Shimano uses on their rear drive train parts to identify them as having common characteristics. The HyperGlide description is therefore applied to chains, cassettes, hubsets, shifters, and derailleurs, both front and rear. HyperGlide is the most recent, of various incarnations in hub/rear-drive changes Shimano has made since 1982, when it was then called "Uni-Glide". Uni-Glide survived, with changes until 1989 when Shimano superseded it with "HyperGlide". 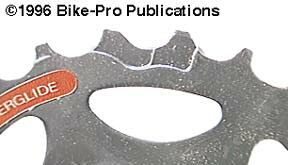 The Uni-Glide system was made in both freewheel and hub cassette models, and what distinguished it from others at the time is the shape and height of the teeth. The teeth on the Uni-Glide rear cog have the top half tapered to a narrow point. The teeth are also twisted, so that the rear of the tooth is inner-most and is twisted to the right as it moves forward. Depending on the number of teeth on the sprocket, every fourth to seventh UniGlide tooth is also cut down to half the height of the surrounding teeth. All these tooth characteristics made UniGlide the fastest, surest shifting system at the time. The twisted teeth pulled the chain, in the direction required for a faster shift to lower gears, the cut down teeth provided a "portal" for the chain to move swiftly through while seeking to engage, and the narrow teeth permitted the chain to settle faster on the teeth for final engagement. UniGlide represented a definite improvement over what had traditionally been available. HyperGlide has improvements in the physical characteristics of UniGlide, and Uniglide cassette cogs can be used on Hyperglide hubs, but not the reverse. HyperGlide cogs have twisted teeth to pull the chain properly to the next lower gear. Rather than having teeth just cut down in height, the HyperGlide cog uses several teeth operating in concert together to facilitate the shift. This pattern of teeth occurs once on cogs up to 16 teeth in size, where it begins to repeat twice. At the 21 tooth sized cog it repeats thrice, and at the 28 tooth cog it repeats four times. The first of the HyperGlide teeth are twisted, with a continually stronger twist, which pulls the chain further and further into the lower gear. The next tooth has no twist, but is cut with a dorsal fin shape which helps release the chain in a shift to a higher gear. This dorsal tooth is thinner and stands more toward the outer side of the bike. This "shift gate" design is, in many ways, similar to other index shifting systems. The purpose of this tooth design is to permit accurate shifts without having to let up on the pedal pressure. 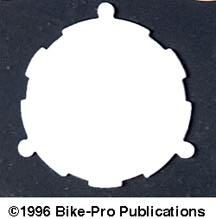 The Uniglide system used cogs that were 1.8mm thick with 3.7mm spacing between them. HyperGlide uses cogs that are 1.8mm thick with 3.0mm spacing between them. In the case of Shimano cassettes, all Uniglide cogs can be used on HyperGlide hubs successfully, HyperGlide hubs accommodate the interior notch pattern of the UG cogs. 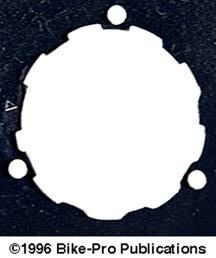 HG cogs have one notch that is wider than the UG hub will accept, and therefore can't be used on older UG systems. This wider notch forces all the cogs to line up specifically, leaving start and stop shift position teeth in an optimum array, for swift shifting. UG and HG hubs are distinguishable at sight. UniGlide hubs have the freehub body exterior threaded on the outer end. HyperGlide hubs have the freehub body exterior threaded on the outer end, and also have the interior of the outer end threaded, for the HG lockring.